Their home was at 131 East Arrellaga Street. 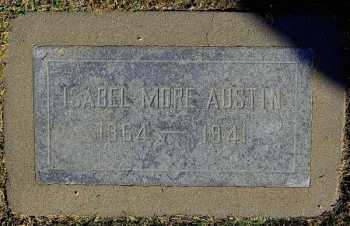 Belle Austin was an artist and author who wrote various fictionalized articles about the Channel Islands that were serialized and published in the Los Angeles Times. She died in Santa Barbara on July 9, 1941. December 10, 1899 [LAT]: “Isabel M. Austin. Delfina...” Ten-part fictionalized story continued on December 17, 1899; January 7, 1900; January 14, 1900; January 21, 1900; January 28, 1900; February 4, 1900; February 11, 1900; February 18, 1900; February 25, 1900. This page was last edited on 21 January 2016, at 09:55.